Find out how you can start your own business in the State of Florida with this step-by-step guide. Includes frequently asked questions. The State of Florida is attractive to entrepreneurs because of its sunny weather, diverse cities, major airports, and strong infrastructure. Starting a business in Florida is a great idea, as long as you know how it needs to be done. In this guide, we'll explain how to start a business in Florida by walking through the necessary steps. We'll also look at some of the specific State rules and regulations that you need to know about when you are setting up your own business. 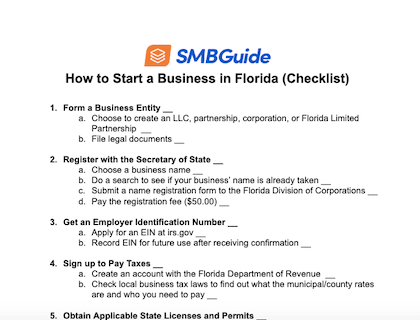 Download our free "How to Start a Business in Florida" checklist in PDF format. There are essentially three different types of business entities that you can create: a corporation, an LLC, or a partnership. You will have to choose which of these entities you would like to create before moving onto any of the other steps. A corporation is a business that is owned by a group of shareholders. Corporations are required to file corporate income taxes. Partnerships are owned by two or more partners. Each partner shares liability for the business and the tax burden is split between individual partners. In an LLC (Limited Liability Corporation), there is no corporate income tax and income is reported on the members' tax returns. LLCs function in a very similar way to corporations. There is another type of business entity in Florida called a Florida Limited Partnership. In a Florida Limited Partnership, there are two kinds of partners. The first is a general partner - someone who manages the business and holds all liability. The second is a limited partner - someone who is an investor in the business who is not involved in management and cannot be held liable. If you have chosen a name for your business, you can go to dos.sunbiz.org/ficinam.html and perform a search to see if the name you like has already been taken. If it hasn't you can file to have it registered at dos.myflorida.com and pay the registration fee by credit card. Alternatively, you can complete the PDF form and mail it in with the required payment. If you file online, your application will be reviewed in 2-3 business days. If you mail the form, processing will take 3-5 business days. Name registration, or "Fictitious Name Registration" as it is called in Florida, is not required to form a business entity, but it will help your business to be more recognizable. An Employer Identification Number or EIN is a number that the IRS can use to identify where an individual's salary is coming from. It's also a quick reference number that you can use to identify yourself to the IRS. By law, every business that employs people must have an EIN. Because of this, one of the first things that you need to do when you're starting a business is to register for an EIN. Registering for an EIN is very easy. You can apply for a number through IRS.gov and the approval process is very fast. Once your application is confirmed, the IRS will send you a copy of confirmation with your EIN on it. Your employees can use your EIN when filling out their own income tax forms. 4. Sign up for State taxes. The Florida Department of Revenue is responsible for collecting state taxes. You can create a business account with the Department of Revenue online in order to remit taxes from sales in your business. Just go to taxapps.floridarevenue.com/IRegistration/ to get started. The county and municipal taxes that your business is subject to will depend on your location. You can contact your county's business office and your city's administration for more details on what the rates are and how to pay. 5. Apply for State licenses and permits. Whatever industry you are in, chances are that there are specific licenses and permits that you need to do business in the State of Florida. 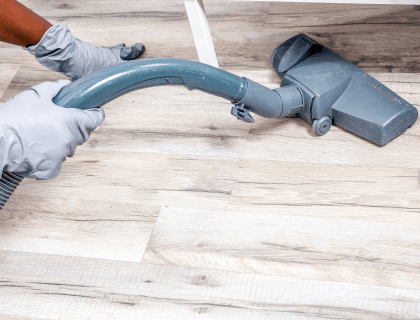 This can be done through the Florida Department of Business & Professional Regulation. You can view requirements by business type on myfloridalicense.com, the department's official website. You can also use the industry pages to find more information about what licenses you need and access application pages. The location of your competitors. Proximity to major urban areas. Car and foot traffic in the area. The type of business that you're operating will have a lot to do with where you end up. Florida's unique geography has a combination of rural areas, major cities, waterfront towns, and municipalities that are only a short drive to bordering states like Georgia and Alabama. Once you have opened the doors of your Florida-based business, you should turn your attention to marketing. Good marketing will help you to spread the word about who you are and what you can offer to potential customers. In a state the size of Florida, you will probably want to target the market in your region or city until your company grows large enough to attract customers from outside your immediate area. Believe it or not, billboard advertising is still very popular in Florida because there are so many busy highways where businesses can catch people's attention while they are sitting in traffic. If you offer a service in a major urban center in Florida, it may be worth your while to market your business on a billboard in or around your city. Of course, the most popular way to go about marketing in this day and age is by establishing a web presence - a website, social media accounts, business listings, etc. Social media accounts will make your business easier to find, and they'll allow you to interact with customers who have questions. You can also use email marketing software with gather contact information from your target market and stay in touch with them regarding promotions and sales. How much does it cost to start a business in Florida? At a minimum, it costs $160.00 to start a business in Florida. This includes four basic fees: the filing fee ($100.00), the certificate of status ($5.00), articles of organization $30.00, and the registered agent fee ($25.00). What is a DBA in Florida? DBA stands for Doing Business As. If you have a Florida DBA, it means that you have a legally incorporated company that is doing business using a different name. Companies do this all of the time to distinguish different brands within one corporation. Is there such a thing as a Florida business license? There is no universal business license in Florida, but every business must have whatever license is applicable to the work that they do. In Florida, licenses are granted by the Department of Business & Professional Regulation. You can find the license that you need at myfloridalicense.com. Choose a business name and file for a license. Can I start a business in Florida with no money? 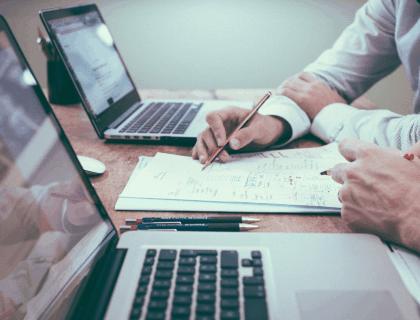 Startup costs in Florida are very low, but if you are trying to figure out how to start a business in Florida with no money, you may have some difficulty. You need at least $160.00 to legally create a business in Florida. Choose a name and do a search to make sure it is available. Register for an Employer Identification Number with the IRS. If you are ready to do business in the Sunshine State, follow these steps to set up your business in Florida. With some patience, focus and hard work, you will soon be a proud business owner. To learn more about starting your own business, check out our step-by-step guide, "How to Start a Business."